Employers in the U.S. will see health care costs rise 9% in 2010, and most expect to pass on that increase to their workers – meaning higher deductibles, premiums and co-payments. According to a report from consulting firm PricewaterhouseCoopers, more workers are likely to utilize their health insurance coverage as a result because they fear they will lose their jobs, and more uninsured and underinsured people will turn to Medicaid for coverage. There are some 50 million Americans in this country that are uninsured. Whether you're an optimist or a pessimist, there's something for you in today's jobs report. The total number of Americans on the unemployment insurance rolls has dropped for the first time since early January, although first-time claims for jobless benefits rose slightly. The Labor Dept. says the number of people claiming benefits for one week or more fell by 148,000 to 6,687,000 million, the largest drop in more than seven years and a sign that layoffs are easing. Still, initial claims for unemployment benefits rose by 3,000 to 608,000 last week, topping analysts' expectations. On a state-by-state basis, Arkansas was the only state to report that initial claims decreased by more than 1,000. Pennsylvania reported the most new claims at 6,891. Many Chrysler employees will soon be back on the back to work. The automaker announced plans Wednesday to reopen 7 of its 11 assembly lines later this month for the first time since the day after the company filed for bankruptcy in April. 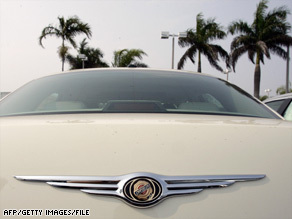 Chrysler said two plants in Michigan, one in St. Louis and one in Toledo will reopen during the week of June 29. Two factories in Ontario, Canada will also reopen as well as one in Mexico. The 7 plants make a variety of Chrysler vehicles, including the Dodge Grand Caravan, Jeep Wrangler and the Chrysler Town & Country. In addition, the company is reopening several factories that make powertrains, axles and other components used by the assembly plants. Chrysler's parts distribution centers, which supply parts to both plants and dealerships, will also reopen. A new car company is planning to open its first factory in what used be a headlight plant in a small town in northern Louisiana. Louisiana economic development officials are enthusiastic about the endeavor which they say will create thousands of jobs. But for now, executives with California-based V-Vehicles, which has backing from billionaire T. Boone Pickens and the venture capital firm Kleiner Perkins Caufield & Byers, are not saying exactly what type of vehicle the company plans to build. Pickens has been active in promoting natural gas for use in automobiles, but it isn't clear what form of energy will fuel these cars. Gas prices rose 6-tenths of a cent overnight to $2.685 - the 51st consecutive increase. In the last 51 days, the average price of gas has increased 63.7 cents or 31.1%. The average price of a gallon of gas is down $1.44 or 35.1% from the record high price of $4.114 that AAA reported on July 17, 2008. The highest gas prices are in Hawaii ($3.041) and California ($3.025). The cheapest gas prices are in South Carolina ($2.503). i agree with many of the comments, this is a very benign, natural high, much less addictive and destructive than either alcohol or tobacco. production, packaging, distribution, and taxation would provide jobs and revunue for our country. regulation by the govenment similar to alcohol and tobacco would decrease the gang control and decrease violence. thank you AC for helping us bring this topic to the forefront. citizens, do not be ashamed to admit that you are for legalization.